On An Overgrown Path: Is a miracle maestro worth £20,000 a concert? Today the Simón Bolívar Symphony Orchestra hits the BBC Proms and 'miracle maestro' Gustavo Dudamel hits the media with the message "I think the most important thing is to make the music accessible... I think we have to make everyone understand that it's important to have a future for the people". There is no disputing that El Sistema does invaluable work making music accessible, as do several other lower profile music education programmes. But less publicised aspects of Hugo Chávez's petro-socialism musical sub-brand also deserve consideration. The BBC Proms appearance of the Venezuelan orchestra is one of just five concerts they are giving on their current overseas tour. Two of the concerts are at the Salzburg summer festival, which is probably the most expensive and least accessible music event in the world. Tour management is the responsibility of the orchestra's agent Askonas Holt, which also represents the miracle maestros's other bands, the Gothenburg Symphony Orchestra and Los Angeles Philharmonic, as well as the Simón Bolívar String Quartet and the soprano in the BBC Prom. For tonight's concert Gustavo Dudamel will receive an estimated fee of £20,000 and an additional payment will be made to the tour management. Around 15% of Dudamel's fee will go to the separate personal agent he now shares with his predecessor at the Los Angeles Philharmonic Esa-Pekka Salonen. 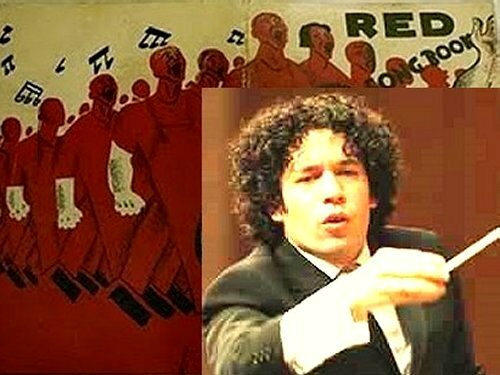 Both the Simón Bolívar Orchestra and Gustavo Dudamel record for Deutsche Grammophon which is is part of Universal Music, the world's largest record company. Universal music is owned by French media conglomerate Vivendi, a global corporation with annual revenues of 29 billion euros. El Sistema's work with the socially disadvantaged is highly laudable, but success does brings its rewards. Today Gustavo Dudamel lives in the Hollywood Hills and is happy to share with us that his favourite restaurant is the $150 a cover Philip Stark designed Bazaar at the SLS Hotel, which is the domain of celebrity chef José Andrés. So, as a mountain of debt threatens to engulf the US and as anyone with investments in UK stocks watches the value of their savings crash by an agent's fee of 15%, is it unreasonable to explore other ways to make the music accessible? And where better to start than with these thoughts from journalist Alex Klaushofer? There's certainly an appetite for a new media model which would share many of the elements of the traditional co-operative. One of the less-discussed factors behind the crisis in journalism - besides the technology-related revolution which has moved so much information onto the free-to-search internet, and the drop in advertising revenues - is the rise in profit expectations. These days media proprietors often expect profits of 25% or more, and cut back on quality in a bid to get to the right figure, with the result that the journalism suffers. So there's scope for a more realistic model which allows the connection between product and profit to be maintained. Add to that the growth in support for community-based organisations in all walks of life and it would seem that, in journalism, the co-operative's time could have come. If you re-read that paragraph substituting 'classical music' for 'journalism' it still makes perfect sense. My research failed to uncover whether the Simón Bolívar Symphony Orchestra is self-governing. But the four main London orchestras (excluding the BBC Symphony) and the Berlin Philharmonic have all been self-governing for a long time. Things are a little different in the States, but the Orpheus Chamber Orchestra, the Colorado Symphony Orchestra, the Louisiana Philharmonic Orchestra, and the Tulsa Symphony Orchestra are also self-governing. The latter three ensembles rose from the ashes of bankrupt contract orchestras, a path that others may well need to follow. Away from symphony orchestras the co-operative model is less well established. But examples include the New York based Composers' Collective, which in the 1930s numbered Henry Cowell, Marc Blitzstein, Hanns Eisler and Aaron Copland among its members, Cornelius Cardews' experiments with his Scratch Orchestra and AMM, and the Camberwell Composers' Collective which has performed at Aldeburgh Music's Faster Than Sound. Recorded music distribution, management agencies and concert promotion seem obvious areas where, as Alex Klaushofer suggests, the co-operative model could restore the connection between product, profit and quality. I will be among many listening to Gustavo Dudamel and the Simón Bolívar Symphony Orchestra performing Mahler's Second Symphony at this evening's BBC Prom. But can we continue to pay miracle maestros £20,000 a concert while orchestras are going to the wall and audiences face financial hardship? Or has the music co-operative's time come? * There is a useful three part article on musicians involvement in the governance of symphony orchestras here, and a guide to setting up a co-operative in the creative industries can be downloaded here. More on the finances of the BBC Proms here and on top musician's fees here. I came across Alex Klaushofer through a chance reading of her Paradise Divided, A Portrait of Lebanon. It is recommended on all counts, but particularly for its chapters on the little-known Druze community in Lebanon, an esoteric sect with links to Islam, Gnosticism, Abrahamism and other philosophies. Background image credit The Cultural Worker. Any copyrighted material on these pages is included as "fair use", for the purpose of study, review or critical analysis only, and will be removed at the request of copyright owner(s). Report broken links, missing images and errors to - overgrownpath at hotmail dot co dot uk Also on Facebook and Twitter. Brilliant! You always ask the good questions and highlight the painful paradoxes of the classical music world. Thanks again.